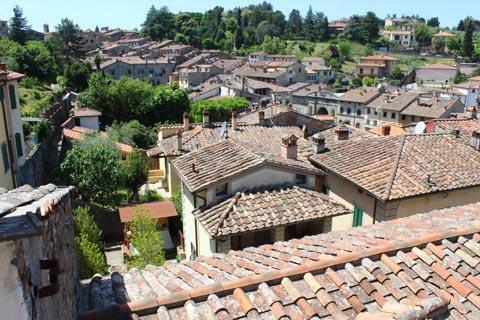 A picturesque small town with a picturesque historic center, Anghiari medieval centre is a maze of narrow streets with numerous characterful houses as well as several churches of interest. 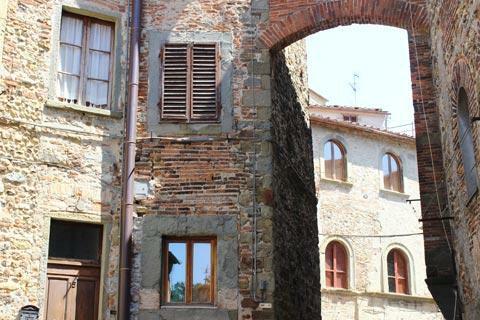 Italy This Way comment: when you first arrive in Anghiari it is not immediately obvious where the old village centre is - keep wandering across the hill or down the hill depending where you park and you will know when you have found it! 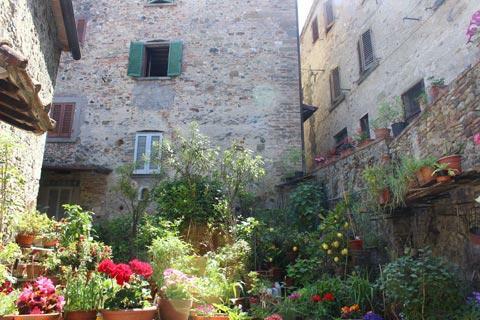 Although the historical centre of Anghiari is quite small the narrow streets, ancient houses and steep alleys have a great deal of charm, and you also have picturesque views across the countryside from various places. 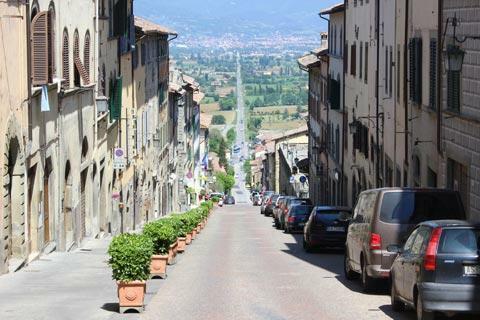 Just outside the old town there is a remarkable street that runs completely straight from the top of the hill, down through the town and off into the distance across the plain where the Battle of Anghiari took place in 1440 - I don't remember seeing a longer, straighter road in Europe! 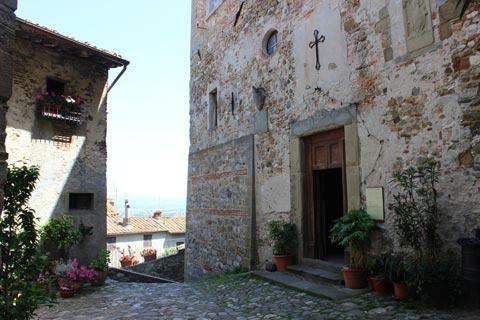 Your visit to Anghiari should include the Santo Stefano Church. Dating originally from the 7th century, the church is in the form of a Greek cross, and the design of this early church influenced the use of Byzantine art in Ravenna, for example the "Mausoleum of Galla Placidia" at Ravenna. Built entirely in brick, the church of Santo Stefano has three apses, which symbolically represent the sacred concept of the Trinity. The central area of the church forms a harmonious whole with the side chapels and a series of arches, and is also enriched by a 15th century painting depicting the 'Madonna and Child with Saints' by Domenico di Michelino (1417-1491). 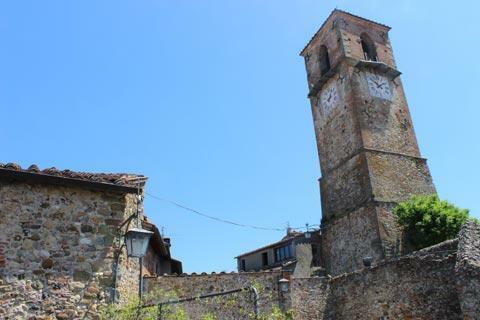 Among the other religious buildings of considerable interest in Anghiari is the Church of Saint Augustine in Piazza Garibaldi and dating from the late 13th century. According to tradition the foundation of the church is linked to Thomas Becket, Archbishop of Canterbury (1118-1170), who spent time in Anghiari during his exile from England. Following after Thomas Becket were some 'Friars Hospitalier', of the Saint Anthony Abbot Order, who built a chapel. In the 14th century, Augustinian monks built a church dedicated to St. Augustine on the site. The church has a simple structure with a single aisle and a portal and facade in the Renaissance style, while the inside is decorated with various 18th century stuccos. Among the notable buildings in Anghiari, one of the highlights is the Praetorian Palace in Piazza del Popolo. 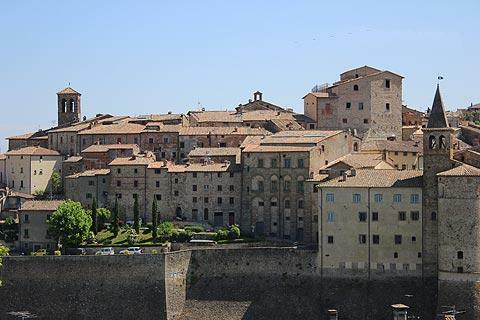 The palace was constructed by the Perusinus in 1339 and on the façade you can see many decorative coats of arms in terracotta and stone that represent the Podestà and the Vicars of Anghiari. 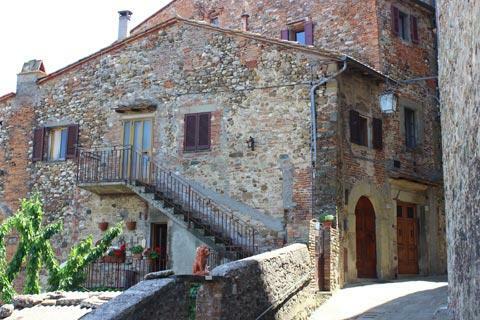 After passing through Piazza Baldaccio and along Via Garibaldi and the Church of Saint Augustine in the Piazzetta Mameli you reach the Taglieschi Palace, formed from several medieval towers and restored in the Renaissance style by Matteo Cane, a Captain of Fortune well known in Anghiari. On a finely decorated column on the corner of the building there is a carved head of a dog. Today the palace holds the Civic Museum with a a large number of important art works by Jacopo Vignali (1592-1664), Andrea della Robbia [1400 c.1481] (The “Nativity”), Jacopo della Quercia (1374-1438), and numerous sculptures and inscriptions dating from Roman times. 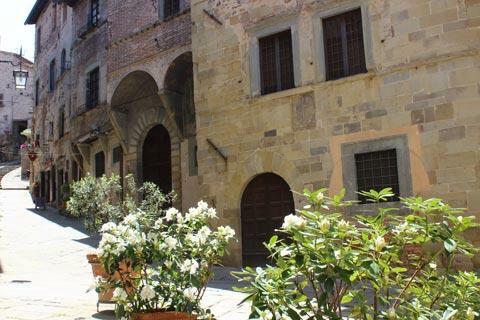 In the same square you can also visit the 14th century Marzocco Palace, a combination of two tower-houses constructed by the medieval mercantile bourgeoisie of city. 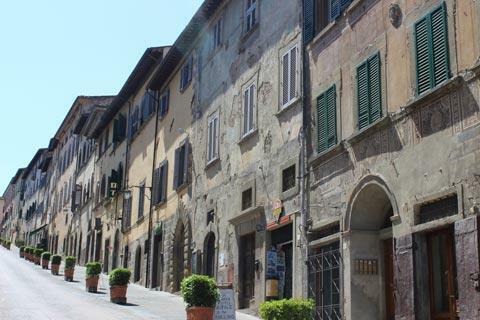 The Marcazzo Palace now houses the offices of the "Documentation of the Battle of Anghiari (see history of Anghiari for details of this important battle), with a large number of documents and testimonies about the battle. Here in the palace you can learn about the highlights of the battle and - just as important - the lost painting of the battle by Leonardo da Vinci, one of his most famous works. On the first floor the Battle of Anghiari is commemorated with a model that reconstructs some aspects of the battle. 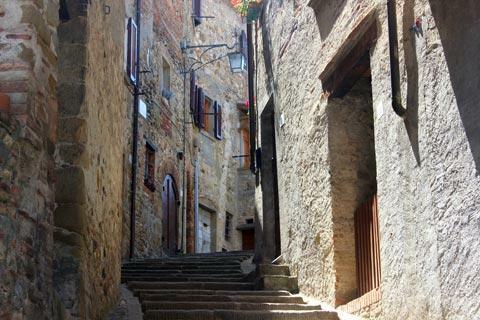 Your visit to the town of Anghiari can finish with a visit to the Fortress or 'Cassero'. Dating from the 14th century the fortress was created by the restructuring of the ancient Abbey of Camaldoli, which once stood in this high position above the village. Other fortifications can also be seen in the area around Anghiari. Nearby there are the 'Castle of Rats' and the 'Castle of Monteauto', both of Lombard origin. Together with others such as the Pianettole Castle and Galbino Castle these create a setting of great interest for its unique historical traditions. At nearby Caprase Michelangelo you can see a castle and the house where Michelangelo is thought to have been born, which is now a small museum. As you might guess, the second part of the village name was added later. The local traditions are also found in the Anghiari cuisine that consists of simple dishes with tasty wholesome flavours accented by the Tiber Valley, such as homemade "Bringolo", panzanella, bruschetta and steak Chianina - to be enjoyed accompanied by the Tuscan wine "Vin Santo". 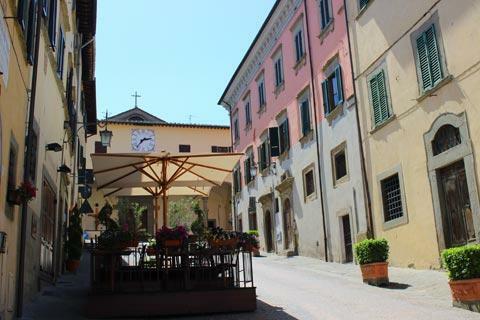 The town is in central-eastern Tuscany, a short distance west of Sansepolcro (birthplace of Piera della Francesca) and east of the lovely medieval town of Arezzo.